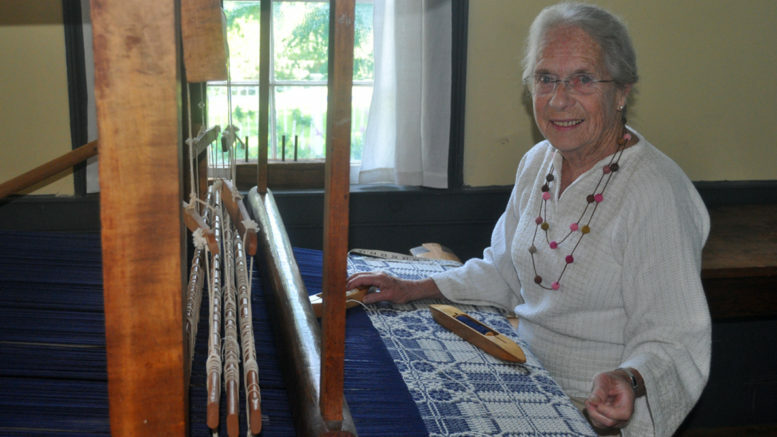 Susi Reinink has been a fixture at Macpherson House over the years, demonstrating weaving on a wooden loom which was present at the home when it first became a museum 50 years ago. Reinink took an interest in fixing the machine and training to be able to demonstrate its use for others. Photo by Adam Bramburger. As the Macpherson House celebrates its 50th anniversary as a museum, one of its original volunteers visits regularly in a testament to how her involvement at the house has changed her life. Almost weekly, Susi Reinink drops by the kitchen at the 192-year-old homestead to move the levers and spools on its wooden loom while creating colourful woven treasurers. “This is my second home,” she says while working in the afternoon light. Reinink said initially nobody was using the loom and the Macpherson House really wasn’t the “living museum” that many know it as today. Other volunteers indicated no one knew how to use it. Initially, she even found pieces of the loom in the attic and had to put it back into working order. To Reinink, the allure of working in an old house led her to volunteer. She said her own home was built in 1813 and she always had an interest in preserving and restoring significant homes. Over the years, she has served on Macpherson House’s board of management for two terms and has seen directors and volunteers come and go. Reinink said, eventually, the volunteers of the Lennox and Addington Historical faced a tough decision about the house. Some members had become too old and a younger generation didn’t show the same time or interest. They passed on management to Lennox and Addington County. While that was tough, Reinink said it has been good for the house. Over the years, Reinink has created 27 coverlet blankets on the loom. She’s also created curtains and floor runners for the home. Now a master weaver, Reinink teaches others about fibre arts and has helped to spearhead fibre arts events, attracting visitors to Macpherson House and to other locations within the community. It all started, however, with a desire to offer a true interpretation of what life was like in her community two centuries ago.